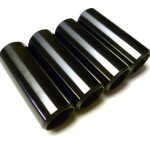 RaceTech Titanium offers DLC coating as an upgrade option on all of the products we sell. You can also send your own parts in for DLC coating. We DLC coat wrist pins, pistons, and other engine parts for race team and engine builders. 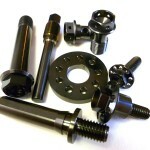 Call today to get a quote on DLC coating your parts or upgrading your RaceTech Titanium order. Increased Lifespan – Parts coated with DLC have low friction coefficients that can prevent cracking due to surface fatigues and improves the lifespan of the part. Preventing Abrasions – DLC coating can protect the surfaces of moving parts from abrasion maintaining smooth movement much longer than uncoated parts. Reliability – DLC coating is an amorphous, stable carbon layer that does not react to acids or alkaline. It is highly resistant against oxidation and corrosions. 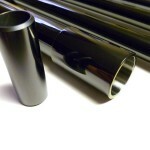 Lubrication – DLC coating provides a low friction coefficient. It can help reduce the amount of lubrication needed on parts & threads. DLC coating significantly reduces thread gall. What does this mean to you in the real world? DLC coating has obvious advantages when used on engine parts. When it is used on internal engine parts it reduces the friction between moving parts (pistons, rings, wrist pins, etc) which results in more horsepower. DLC coating on critical parts like axles, pivots, and linkage bolts has shown an increase in the life of the part. Over time uncoated parts show signs of wear and fatigue long before coated parts. DLC coating on threads signifiacntly reduces galling. You can literaly feel the difference when you put a DLC coated nut on a DLC coated bolt. The nut will thread onto the bolt as though lubricant has already been applied. Less lubricant is required on DLC coated fasteners. This is particularly beneficial on critical parts that have a specific torque specification. Coated threads will give a more accurate torque reading. Contact RaceTech Titanium if you want to get a quote or learn more about DLC coating.